When he announced his bid to become president of Mexico, Andrés Manuel López Obrador spoke of the country’s economic crisis, violence and corruption. “According to our diagnosis, the problem originated from the application of the so-called neoliberal model that has not yielded results,” Mr. López Obrador said. Commonly known as AMLO, Mr. López Obrador is the clear front runner when Mexicans elect their next president on July 1, 2018, with many polls in recent weeks showing him with a 20-point lead or even greater over his competitors. A leftist critic of the two main parties that have held the presidency for the past 90 years, Mr. López Obrador has made promises to create an “economy for everybody” a key pillar of his election campaign. “The way he would like to see the country working and the way he would like to see the economy function is in a… more nationalist way than the current administration and previous administrations have done it,” says Carlos Petersen, a Latin America analyst for Eurasia Group. “He is against the overall structural reforms and neoliberal reforms that have been implemented in the country over the past 20-30 years. He has always been very critical of that,” Mr. Petersen told The World Weekly. Mr. López Obrador has been vocal about his desire to bring change. In campaign speeches, he has vowed to stop privatisation policies, help Mexican businesses and promote domestic and foreign investment. While maintaining that he will not raise taxes, he aims to eliminate corruption and use the money on social programmes. Some investors have been unnerved by parts of his leftist policy proposals. However, his platform “stresses that he is pro-business, and particularly small business and entrepreneur,” says Christy Thornton, professor of Sociology at Johns Hopkins University. In this context, he made Alfonso Romo, a wealthy businessman from the northern city of Monterey, a top economic adviser and his designated chief of staff. According to Mr. Petersen, Mr. López Obrador’s rhetoric has been more conciliatory towards the business sector than in his previous attempts at the presidency in 2006 and 2012. During campaign rallies he has stressed that “businessmen will not have problems in our government, they are going to be respected.” Statements like these , Mr. Petersen adds, have made parts of the business community “not less scared of him, but less able and capable of attacking him”. Some observers think that the leftist candidate is starting to gain the confidence of parts of the business sector. Mr. Romo believes that the massive lead Mr. López Obrador has in the polls can be attributed to the support of businessmen, the middle class, and merchants. 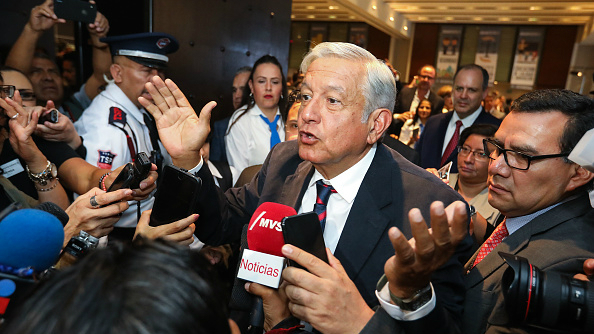 The leader of the Employer Confederation of the Mexican Republic (Coparmex), said investments by companies would not stop if Mr. López Obrador ascends to the presidency. Mr. Petersen does does not see any volatility in the market if Mr. López Obrador wins the election. “My sense is that there isn’t going to be a meaningful depreciation of the peso or a sell-off of Mexican assets, because the chances of López Obrador winning are so high, the markets have already priced in that result.” He adds, however, that this could change once Mr. López Obrador is in office. Despite his outreach to the business community Mr. López Obrador has a long history of criticising the Mexican elite, which has has made him powerful enemies in a sector of society he calls the “mafia of power”. These are people that the presidential candidate believes have earned their fortune with the help of corrupted government officials. Parts of Mexico’s business elite have not been shy about their opposition to the leftist candidate. A number of powerful businessmen, including the country’s second richest person, Germán Larrea, have told their employees to vote against Mr. López Obrador - either implicitly or explicitly - warning against the risks of a triumph of the “populist model”. “To some extent, they truly believe that he could be a problem for the Mexican economy, says Mr. Petersen, adding that some “could be at risk under a López Obrador administration”, given how their companies have benefited from the current system to control certain sectors. Mexico’s Gross Domestic Product rose to a high of $1.298 trillion in 2014, but subsequently fell to $1.047 trillion in 2016, according to World Bank data. GDP per capita in the same time period fell from $10,453 to $8,209. Others in the business sector are fearful of how Mr. López Obrador may act in regards to the oil reforms that were passed under the current administration of Enrique Peña Nieto, which granted private companies, both foreign and domestic, the rights to explore and drill for oil in Mexico. The country’s oil sector, which had been nationalised in the 1930s, had been under the control of state-owned oil company Petróleos Mexicanos (PEMEX). “The business class fears that AMLO will ‘reverse’ the economic reforms that Peña Nieto has driven through during his term… while AMLO has gone out of his way to say he will respect agreements that were negotiated transparently,” Professor Thornton told TWW. His critics see Mr. López Obrador as advocating for outdated policies, someone who allegedly longs for the time of Import Substitution Industrialisation, an economic model popular in mid-20th century Latin America that stressed national production. They cite statements like “Mexico needs to consume what it produces” as evidence. If Mr. López Obrador wins the election on July 1, he will face many challenges, including the renegotiation of the North American Free Trade Agreement (NAFTA) with the US and Canada, as well as dealing with an economically unequal society and a population that is fed up with corruption. There is apprehension among observers about plans to divert money into public projects by clamping down on corruption. A López Obrador administration could end up facing a “mismatch between spending and resources” which could create additional fiscal pressures, Mr. Petersen concludes. Dealing with Mexico’s challenges may appear easier on the campaign trail then from the office of the presidency.